"A DUKE REID PRODUCTION JAMAICA"
INSCRIPTION QUI SERA DONC DÉSORMAIS ABSENTE DES TR 600 D'AUTANT PLUS QUE LA SÉRIE TR 600 EST SURTOUT AU DÉBUT FAITE DE PRODUCTIONS DANDY ANGLAISES. 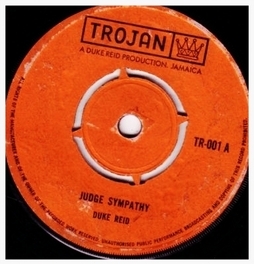 MAIS IL N'Y A PAS DE PETITES ÉCONOMIES ET POUR CONTREDIRE CE QUE JE VIENS D'AFFIRMER ON TROUVE LE TOUT PREMIER SINGLE DE LA SÉRIE TR 600 LE TR 601 AVEC LE LABEL PAPIER DE LA PREMIÈRE SÉRIE AVEC LA PETITE PHRASE "A DUKE REID PRODUCTION JAMAICA" CE QUI EST UN TOTAL CONTRESENS POUR CE 45 DONKEY RETURNS DE DANDY... MAIS IL DEVAIT RESTER UN STOCK DE LABELS IMPRIMÉS À UTILISER. SUR CES 15 SINGLES 3 N'ONT JAMAIS VUS LE JOUR À SAVOIR LES RÉFÉRENCES TR 012 - TR 013 ET TR 014 ET UNE ÉNIGME PERSISTE TOUJOURS SUR LA SORTIE OU NON DU TR 008. POURTANT IL EST QUASIMENT CERTAIN QUE CE TR 008 N'AI JAMAIS ÉTÉ PRESSÉ CAR LORSQUE L'ON CONSULTE LE REGISTRE DES DÉPOTS OFFICIELS : THE RECORDED INSTITUTE OF SOUND CETTE 8ème RÉFÉRENCE N'A JAMAIS ÉTÉ DÉPOSÉE DONC A PRIORI EN TOUT CAS OFFICIELLEMENT LE TR 008 N'EXISTE PAS. CE REGISTRE NOUS RENSEIGNE ÉGALEMENT SUR LES DATES EXACTES DE DÉPOT ET DONC DE SORTIE DU DISQUE. 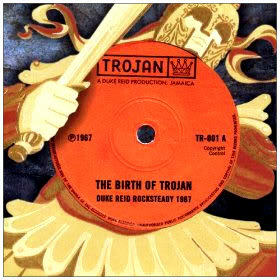 AINSI LES 45T DE CETTE TOUTE PREMIÈRE SÉRIE TROJAN ANNONCENT LA NAISSANCE MÊME DU LABEL AU 28 JUILLET 1967. POUR PLUS DE DÉTAILS VOICI LA LISTE COMPLÈTE DES PARUTIONS DE CETTE SÉRIE TR 000. ON NOTERA DONC QUE TOUT NE FUT PAS CHRONOLOGIQUE. EN EFFET LA RÉFÉRENCE TR 011 SORTIE LE 01 DÉCEMBRE 1967 FUT ÉTRANGEMENT PROGRAMMÉE AVANT LES TR 009 ET TR 010. MAIS BON CHEZ TROJAN CELA DEVIENDRA UNE QUASI HABITUDE PAR LA SUITE. 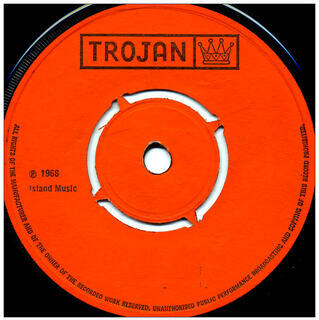 POUR RETROUVER TOUS CES SINGLES PROCUREZ-VOUS SIMPLEMENT CETTE COMPILE QUI LES REGROUPE : FACE A ET FACE B.
À 6 JOURS PRÈS CELA FAISAIT EXACTEMENT 35 ANS ENTRE CETTE COMPILE THE BIRTH OF TROJAN ET LA VÉRITABLE NAISSANCE SYMBOLISÉE PAR LE PREMIER SINGLE TR 001. À NOTER LA SORTIE COFFRET VINYL REGROUPANT TOUS LES SINGLES EN ASPECT D'ORIGINE ET DONC EN VINYL : UN MUST.